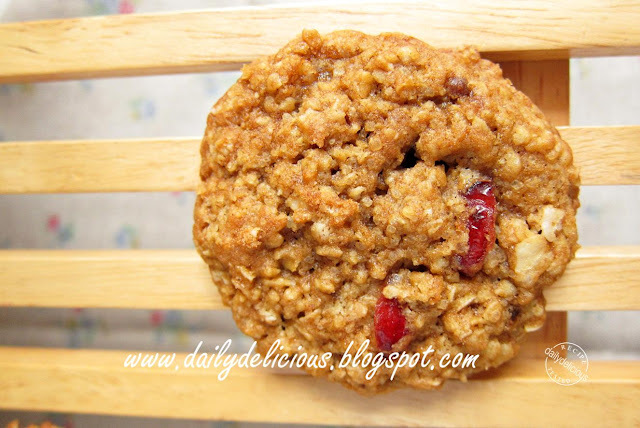 Actually, someone requested oat biscuit, ^^", but when I searched for the recipes, I found this one, and I really wanted to try it. Soft and chewy, the taste of the oat, brown sugar and cranberry, they are one of the best combination. Making cookie is one of the easiest thing that you can bake, ^^. 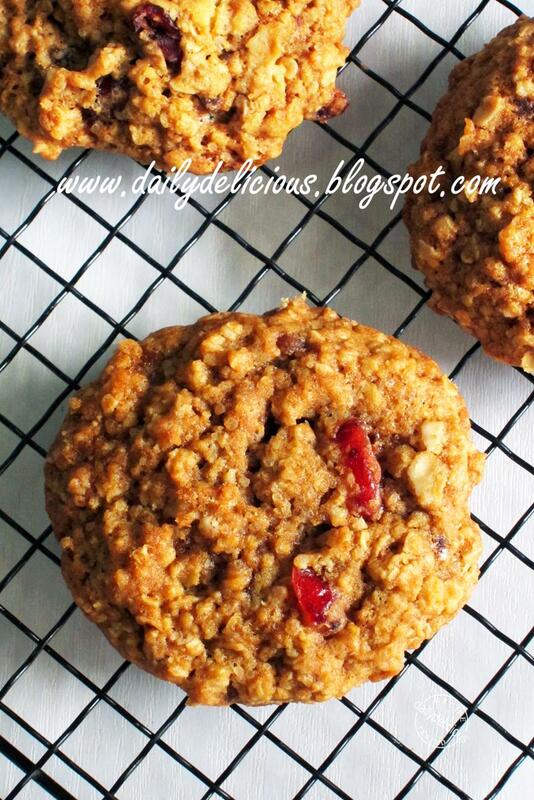 I use quick cooking oat because I don't want my cookie to be too chewy, but if you like you can use rolled oat too. The soft cookie is tricky to bake, because you won't bake it until it becomes hard and brittle, using the time as a guide line, and check the bottom of the cookie, it will brown beautifully. 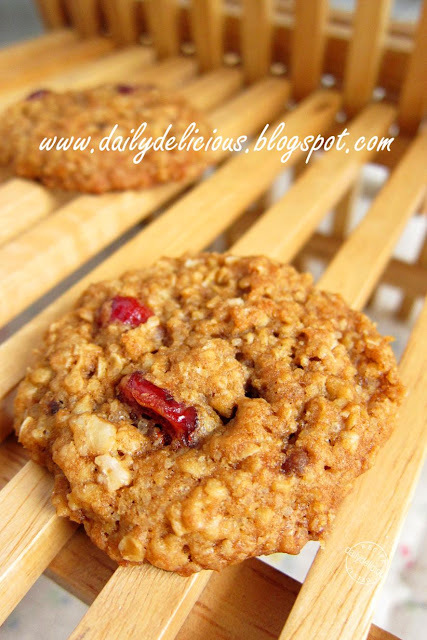 The cookie will firm up as it cool, but if you want it to be drier, after it cool, just bake it in the 150°C for 15 minutes, anyway, because the cookies contain the brown sugar, it will be soft again. 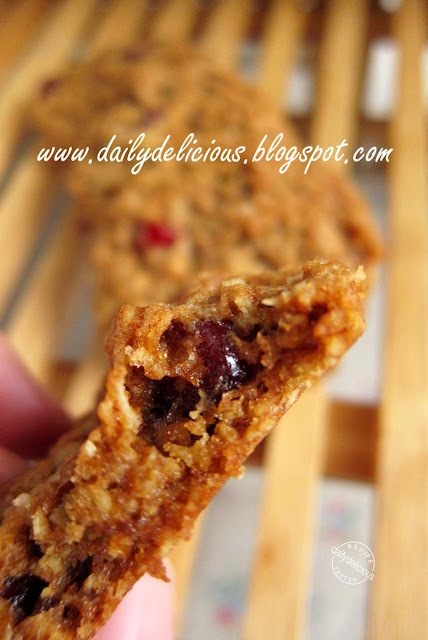 For me this cookie is so addictive, I can't stop eating it, haha, serve it with a cup of tea or milk (for children), I think I can call it a healthy cookie because you will get a lot of fiber form it, ^^. Ps. Last 2 week, I deleted a lot of e-mail by mistake ^^", so if you wrote to me and I didn't answer it, please write to me again, I try my best to answer every e-mail. Sift the flour with baking soda and cinnamon powder and set aside. Line the sheet pan with baking paper. Cream the butter with salt and both of the sugar until light in color. Add the vanilla, beat to combine, add the egg and beat to combine. 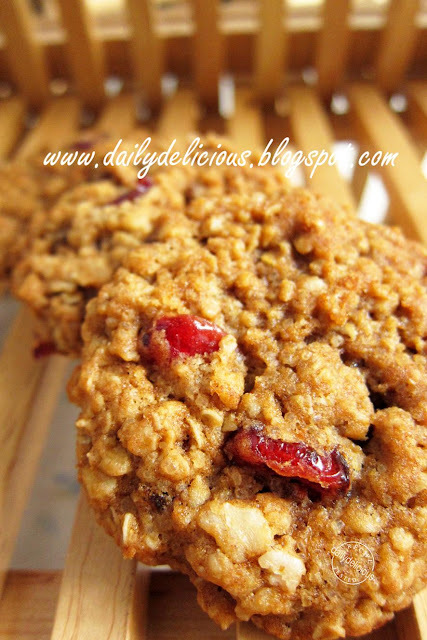 Pour the flour mixture, oats and cranberry into the bowl and fold to combine. Scoop the cookie dough onto the prepared pan. Bake for 10-12 minutes or until the bottom of the cookie start to brown, (the cookies will be soft), let it cool completely on the baking sheet. I love this! Will try it when I get cranberries:D Thanks for sharing! I will make these this weekend. Do you have to use both light and dark brown sugar? I only have dark. Raspberry Pistachio Tea Cake: Short cut baking! Chocolate Crackles: Sweet cookies, lovely gift!